STORIES UNFOLD. From heritage brands, steeped in tradition, still handcrafting products with centuries old techniques to emerging start-ups, disrupting the industry with innovation, every brand, person and product has a story to tell. Join the showrooms of the D&D Building along with luminaries, celebrities and brand experts who have harnessed the power of storytelling to evolve their craft and infuse richly layered romanticism into their projects. Over the course of two information-filled days – comprised of six Keynote Events, 20 In-Showroom Programs, two Special Events, one Special Program, three Cocktail Receptions and 114 Open Houses – guests will discover the value these narratives can bring to their projects; how the ever-evolving design community shares their stories today in the digital space; and how thoughtful design can express a client’s unique individuality without saying a word. Storytelling is an art. Design is a story. 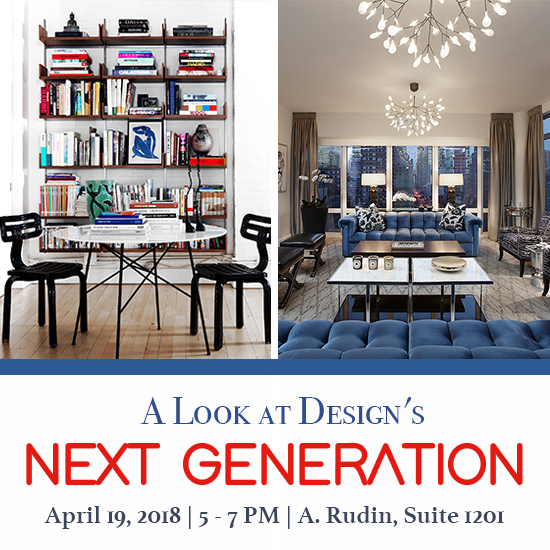 Join AD’s Editor in Chief Amy Astley as she moderates a tell-all conversation with designers-to-the-stars Brian Sawyer of Sawyer | Berson and Monique Gibson. Infusing a space with the individuality and unique experiences of a client always comes with its challenges, but Sawyer and Gibson have mastered this task for celebrity clients like Bette Midler and Meg Ryan. Astley and her panelists share stories about and offer expert advice into decorating rooms with art, furniture, and objects that reflect the people who live in them. When creating the ultimate interior, great designers consider each of the five senses—and how they harmonize together—to tell the ultimate story. Please join Baccarat on a sensorial journey with Martha Stewart, Shawn Henderson and Stephen Sills for a panel discussion led by Dan Rubinstein, Home + Design Editor of DEPARTURES, to explore the profession’s best practices and each of the panelist’s greatest career triumphs in sights, sounds, and beyond. The 150th anniversary of Frank Lloyd Wright’s birth is cause for celebration. Through 2018, events around the country will commemorate Wright as a singular force in the world of architecture and design. These jubilations provide a unique opportunity to reevaluate Wright’s work and ideas, and in this spirit, Metropolis Senior Editor Samuel Medina will moderate a panel discussion between Jennifer Gray, co-curator of Frank Lloyd Wright at 150: Unpacking the Archive at MoMA, and Stuart Graff, President and CEO of the Frank Lloyd Wright Foundation. Rather than adopt an overly retrospective bent, this discussion will touch on connections between the Wright’s work— buildings, designs, writings—and the current thinking about design, sustainability and culture, among other topics. 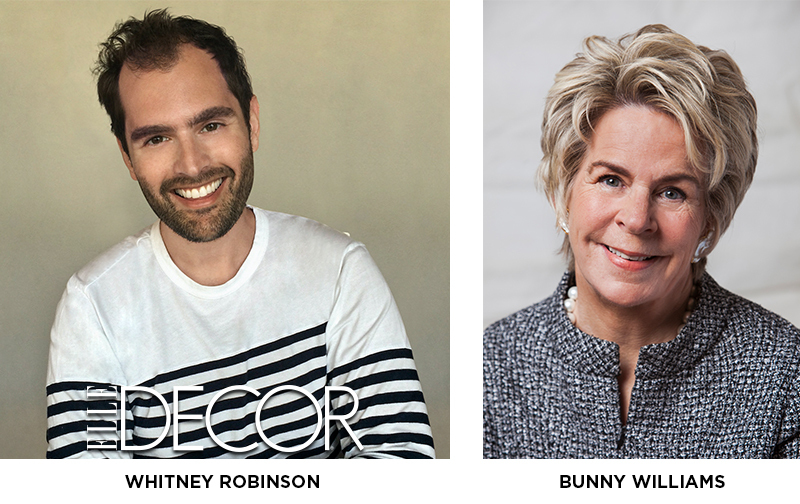 Join ELLE DECOR Editor in Chief Whitney Robinson and acclaimed designer Bunny Williams in the new Kravet showroom for The Story of a House. Interior designers are more than just the creators of beautiful rooms. 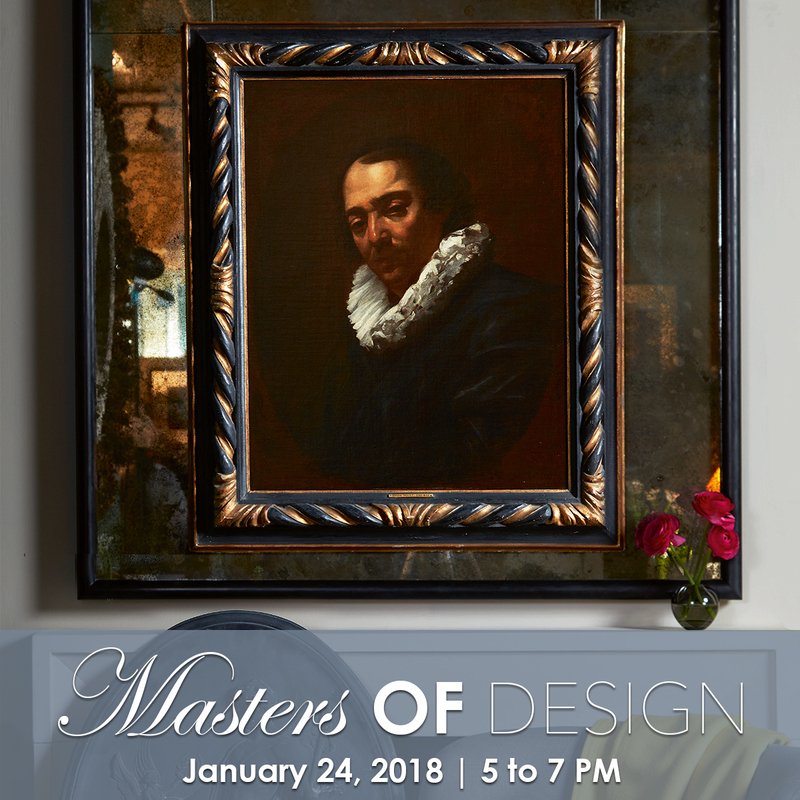 They’re conductors who seamlessly blend an orchestra of architects, landscape designers, art consultants, and antiques experts to create a finished home. Whitney and Bunny will be joined by members of this secret team: The people who build it, the products that fill it and the process for how it all comes together. STARK invites you to join House Beautiful Editor in Chief Sophie Donelson and designers Amanda Lindroth, Alexandra Angle and Bennett Leifer for a lively chat on creating rooms with compelling narratives and a peek at Style Secrets, the brand-new book from House Beautiful. Learn how to draw personal storylines from clients and create a visual language that brings them vividly to life. 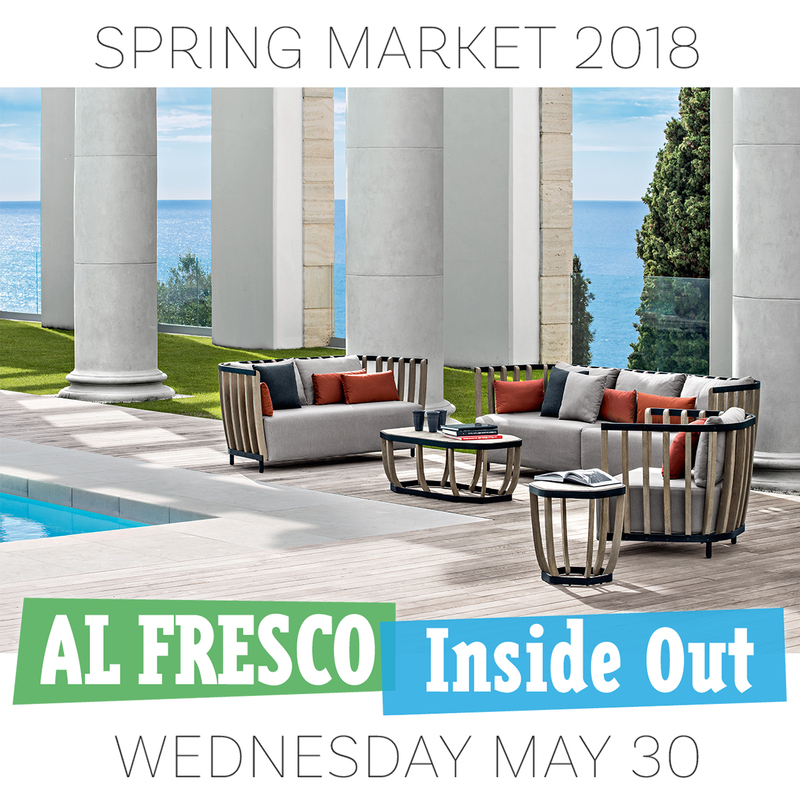 Join VERANDA Editor in Chief Clinton Smith at the newly branded Style Library showroom as he chats with California-based design dynamos Brooke and Steve Giannetti and their son Charlie as they discuss the next chapter of their company’s evolution. With a robust architecture and design business spanning 20 years, a decade of Brooke’s popular blog Velvet & Linen, two bestselling books (and a third in the works), the Giannetti’s influence lives well beyond the West Coast. Now working with their son Charlie, learn how they are expanding the furniture and fashion line with a groundbreaking mixed-use studio in downtown Los Angeles that is bringing artisans and makers together, plus discover how a new outpost in Santa Barbara will combine architecture, interior design, furniture and their new eponymous fashion label all under one roof. This is one family’s story for conveying a vision and lifestyle across generations with a full 360-degree approach. Enjoy cocktails and the conversation while celebrating the new collections from Zoffany, Sanderson, Morris & Co, Anthology, Harlequin and Scion. 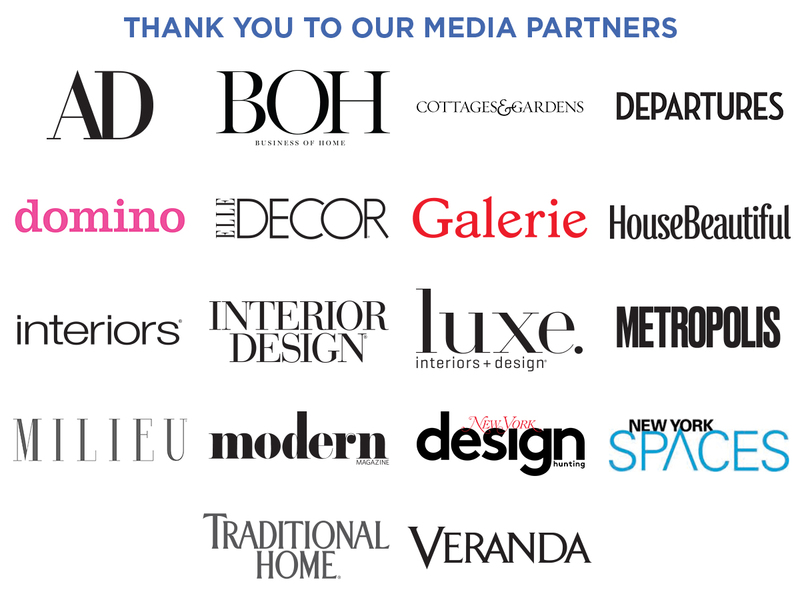 Stories are the currency of the design industry; appreciating in value with each passing year, constantly in demand and evolving ever-forward, shared and traded by brands, empowering designers, impressing their clients and ultimately dazzling their guests. The enriching tales of the people, products and processes behind each element in a space can add immeasurable value to a company, project or home. 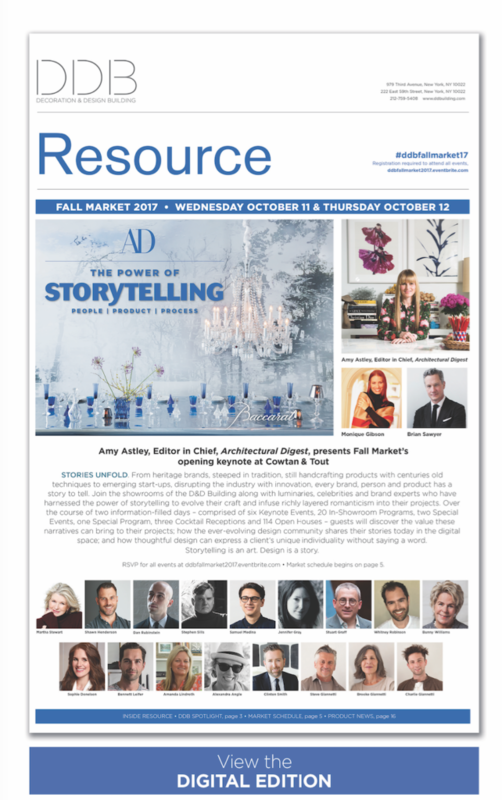 During a two-day Fall Market, the showrooms of the D&D Building will present 20 inspiring In-Showroom Programs, two experiential Special Events, one must-see Special Program and three celebratory Cocktail Receptions for a glimpse at the undisputed POWER of storytelling. The top talents in the industry will swap stories with the leading editorial beacons to share their expert insight into the fine art of storytelling.